The student loan problem in America is most often referred to as a crisis. Although this is an apt description, “crisis” usually means something terrible but short-lived. But in the case of excessive student loan debt, the opposite is true. For many young adults, this burden is going to affect them in negative ways throughout their entire lives. The worst impacts may not even be visible now, but will be felt by borrowers as they get older, have families, and especially when they face retirement. The value of outstanding student loans has tripled over the past decade to over $1.4 trillion as education costs have skyrocketed. Despite a healthy economy and a recovering job market, more than 8.5 million borrowers are now in default, representing over 10 percent of all loans. This is higher than the default rates on credit cards, auto loans, home equity loans, and mortgages, according to recent data from the Federal Reserve Bank of New York. What about those who aren’t in default? Ongoing student debt burdens also affect their lives in profound ways. In early adulthood, it’s impacting their careers, forcing them to take or stay in jobs they otherwise wouldn’t want, because they need the income. For the same reason, burdened professionals are less likely to launch new companies. “Life Delayed,” a 2015 white paper by education nonprofit American Student Assistance, revealed that 61 percent of respondents interested in starting a new business couldn’t do so because of their student loans. A 2015 study by the Federal Reserve Bank of Philadelphia demonstrated that increasing student debt decreases the formation of small businesses, as would-be entrepreneurs become more risk-averse and reluctant to take on new debt. In similar ways, student debt affects such major life decisions as starting a family and buying a home. Before the housing bubble burst in 2009, the homeownership rate among adults 35 or younger was 44 percent at its 2005 peak; today, it’s 34 percent. A 2017 survey of more than 2,000 student loan borrowers found that 41 percent had to delay getting married and 55 percent postponed starting a family. Most significantly, 83 percent of non-homeowners believed their student debt had delayed them from buying a home, and the vast majority of them could not save for a down payment. For those who postponed buying a home due to student debt, the median delay was seven years. It’s not just young people, either. Research done by the Federal Reserve Bank of New York found that among all Americans, as much as 35 percent of the decline in homeownership between 2007 and 2015 could be explained by student debt. Considering that almost half of young Americans don’t attend college, this number likely understates the impact student debt has had on decreased home buying. 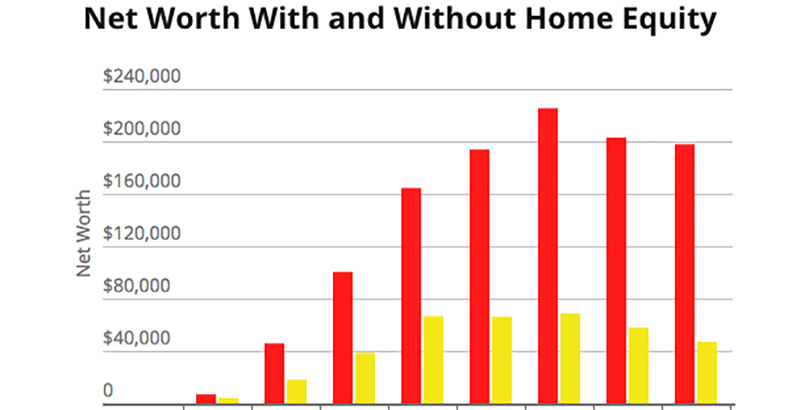 In America, owning a home is the primary way people of average income accrue wealth in today’s economy; delaying this purchase for years (or not buying a home at all) prevents debt-burdened millennials from accessing the home equity that is essential for building long-term wealth and providing for their retirements. For millennials, being unable to buy a home deprives them of the ability to build a nest egg. At the same time, having student debt obligations prevents them from building wealth through good old-fashioned saving. With the diminishing number of jobs that provide defined benefit plans and traditional pensions, many young adults may not end their careers with enough home equity and savings to be able to retire at all, at least in the traditional sense. It may be another 30 to 40 years before we see the most destructive impact that the student loan bubble will have on the lives of those affected. This is why resolving the crisis not only means finding ways to reduce or subsidize education costs so students don’t have such large debts in the first place, but also helping current graduates pay down their debts faster so they can begin to build toward their future. Scott Thompson is CEO of Tuition.io, an employer-funded student loan contribution platform.